How would you like to design your Flyers? With this great value paper, you can afford to promote BIG. Any size for any occasion, Flyers always get you noticed. We've created a range of Flyer designs to help inspire you. Just drop in your details, add your logo and make them yours. What is the Safe Area, Bleed, and Trim? The printing process isn’t perfect, so to make sure your Flyers come out looking the best they can there are a few guidelines to follow. What we’re talking about are the Safe Area, Bleed, and Trim. While these sound like complex (and painful) print terms, but they are actually quite simple once you get to know them. Take a look at the size specific tabs to know more. For more details on dimensions and guidelines for your Flyers, head over to the specific size tab. Make sure that your background extends to fill the bleed to avoid your A6 Flyers having white edges when trimmed. This is where we aim to cut your A6 Flyers. Make sure that your background extends to fill the bleed to avoid your Square Flyers having white edges when trimmed. This is where we aim to cut your Square Flyers. Make sure that your background extends to fill the bleed to avoid your A5 Flyers having white edges when trimmed. This is where we aim to cut your A5 Flyers. Make sure that your background extends to fill the bleed to avoid your DL Flyers having white edges when trimmed. This is where we aim to cut your DL Flyers. 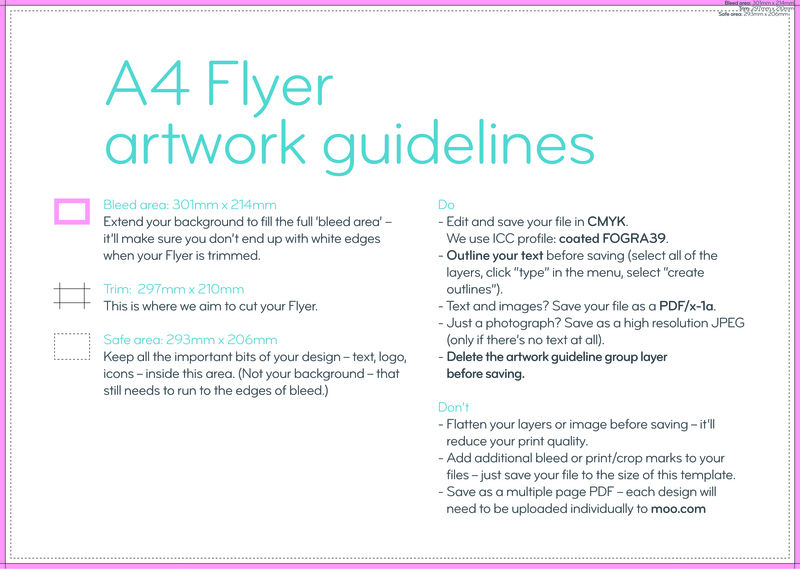 Make sure that your background extends to fill the bleed to avoid your A4 Flyers having white edges when trimmed. This is where we aim to cut your A4 Flyers. The perfect way to add your brand or logo to anything. Colorful and customisable, our Stickers come in Round, Rectangle and Stickerbook size. Double-sided Postcards available in Original and Luxe stocks.